Dental implants are artificial tooth’s root replacement which will hold the future tooth restoration. They consist of three parts: implant, abutment and a crown/bridge/denture. You can see on a picture implant structure and different types or restorations. The amount of implants needed depends on the restoration complexity and bone strength. If you need to replace all your teeth, you’ll probably need to have at least six implants in your upper jaw, and between four and six in your lower jaw. If Implants are well taken care of, they serve a lifetime. Implant manufacturer gives a lifetime warranty against any implant breakage. Most adults with good general health, healthy gums and strong jaw bone can have dental implants. They can only be used once the jawbone has stopped growing therefore younger patients aren’t suitable. Habits such as heavy drinking or smoking can increase the number of problems associated with initial implant healing and thereafter may be bad for the long-term health of gum and bone surrounding each implant. Some dentists will decline to place implants if smoking cannot be reduced or given up altogether. People with diabetes, osteoporosis, cancer and after radiotherapy fall to bigger risk group as well. Each case is individual and if you have any medical issue, please discuss it with your dentist before starting the treatment. 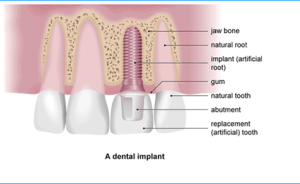 What happens during dental implant procedure? Time frame of implant placement and restoration will depend on how many implants you’re having and how complicated the procedure is. If you need full mouth works, sinus lift or bone graft, it may take longer than just placing a single implant. Usually process varies between 6 months up to a year. do other measurements. Then he will discuss with you full treatment procedure, answer all your questions and refer you for a CT scan or an OPG x-ray to a special x-ray centre. After we get the image back, we will send you a full treatment plan with pricing. 2. Extractions and dental hygiene. Some patients need to have remains of old teeth removed and perform deep scale and polish to have gums prepared for the dental surgery. Any plaque and tartar around the teeth present a source of infection and can lead to an implant failure. This stage is optional and for many patients may not be needed. 3. Implant placement. Once the anaesthetic has taken effect, your dentist will make a cut in your gum and drill a small hole in your jawbone. The implant will be screwed into this hole. At the end of the procedure gums will be stitched back. If after opening the gum dentist sees that there isn’t enough of bone or it is too soft to hold the implant in place, he may propose you a bone graft. These are artificial bovine bone granules, which after placement into the mouth harden and create a new layer of bone. You will need from 4 to 6 months for the bone graft to get strong enough for an implant placement. During this time, you might need to have temporary partial dentures so you can’t see the spaces between your teeth. If you usually wear complete dentures, they can be adjusted so that you can wear them during this healing period. 4. Removal of stitches and healing abutment placement. When the implant has integrated successfully into the mouth, then a healing cap will be added to the implant fixture. It will allow creating some space for the future restoration in the gums. 5. Final restoration. It includes taking impressions, sending them to the lab for final teeth preparation and fitting lab work into the mouth making sure they are comfortable and colour matches your natural teeth. This phase can last up to 2 to 8 weeks, after which you will have your brand new smile! First few hours after the surgery try not to eat anything. Anaesthetics will wear off gradually within few hours and it is advised not to consume any hot food as you may not feel the temperature and burn your mouth. You may need to take some pain relief medicines as well to help with any discomfort as the anaesthetic wears off. Only eat soft foods for the first week after having dental implant surgery. Implant has to integrate well into the bone and can’t be moved. It’s really important to keep your mouth clean by brushing and flossing as usual. Dentist will advise you special brushes that make it easier to clean between your teeth. It is normal to have pain and swelling for up to 7-10 days after the surgery. Dentist will usually prescribe antibiotics and an antiseptic mouthwash to reduce the risk of your implant getting infected. Once you have made a full recovery, your implants and replacement teeth should work the same as natural teeth. Medidenta dental surgery is proud of our professional implant dentists proposing competitive dental implant costs without any compromises on the quality of care. We strive for the right balance for our patients in achieving a very high quality service at a fair cost, representing exceptional long term value. You may pay for your treatment by installments through the course of treatment. The exact cost of a dental implant or teeth implant treatment can only accurately be calculated after full examination. But feel free to give us a call to get rough idea how much you can expect to pay. our friendly and knowledgeable will be happy to assist you and provide clear information about the cost of dental implants and the various treatment options available. Please call us on 07576775552.